God gave me a big surprise last Sunday evening. I looked over the audience and I noticed a young lady in her thirties sitting toward the back if the building. I walked up to her and she said hello Keith. I don’t know if you have ever been in that situation before but I was a little embarrassed. I did not know her but she knew me. She introduced herself to me and then l could see a little girl who rode the Joy Bus twenty years ago. This truly brought a smile to my face and ﬁlled my heart full of joy. Many seeds have been planted throughout the life of the Joy Bus Ministry and we will continue to plant and God will reap the harvest. I want to thank the family at Woodsﬁeld for the great support and efforts made to keep the Bible School on wheels rolling for the Lord. It’s moments like Mrs. Smith who reminds me that sometime it takes a seed time to grow. All I remember is a little girl dangling her legs off the Joy Bus seat ‘and now a beautiful young women worshiping and praising God with the family at Woodsﬁeld. The family at Woodsﬁeld truly cares about the souls of adults and children and that’s why we have this local evangelist ministry called the Joy Bus Ministry. Thank you for your prayers, giving and talents in seeking and saving the lost. I wait eagerly for moments like this. Even though I want instant results, sometimes we wait. I love it when God surprises me with great moments like this. Let us continue to fulfill the great commission and go into all the world and that includes Monroe County. October 4th was a great day of worship in Bible hour. The children learned about Elijah and after worship the family was invited for hot dogs, chips, cake and drinks. When we arrived at the pond each child got to fish and most of them caught fish. 40 fish were caught and released back into the pond. This was our 15th year and seeing Martha Lee’s smile and feeling the warmth of Clyde Ault’s heart brought a great day of Christian fellowship. The church family responded well with volunteers to help kids fish, measure fish, document the names of people, food, bathroom monitors, and watching for the safety of children around the pond and woods, setting up the poles, driving and knocking doors, setting up Bible studies, cleaning up and the list goes on. Thank you to the Fellowship Ministry, Teen Ministry, Bus Ministry, Benevolent Ministry and Education Ministry for all your help and support for another year of fishing. Congratulations to Cooper Hayes for catching the largest fish. Coopers name will be on the 2015 Clyde Ault, Foxy Daily biggest fish award plaque in the Fellowship Building. God has given all of us the opportunity to bring souls under the sound of the Gospel. It takes work, time and money to accomplish this for God. This family is to be commended for your love and compassion to support an outreach to our community. in winning souls. A special thanks to Gods family for your prayers and kindness in touching lives for Jesus. We will be running two Joy buses in the Woodsfield area. If you know of any prospects that would want to ride to worship services Sunday morning, contact the office at 740-472-5321. We appreciate the workers who serve in this Ministry and pray that the Ministry will grow in souls being baptized and saved. Our challenge to the church family is to watch the streets of Woodsfield and look for potential riders. Please call in their names, address and phone # if you can and we will make a visit to see if God's Bible School on wheels can bring them under the sound of the God's Word. Your love to win souls can make a difference with just one phone call. Let’s do what we can to fulfill the great commission and go into the world and preach the gospel. 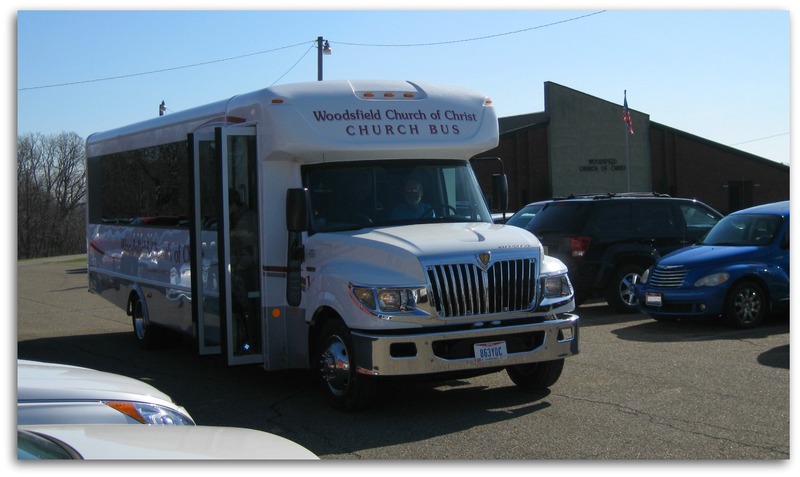 Without a doubt, the most visible ministry of the Woodsfield congregation is the collection of JOY Buses that travel the county each week. Since 1978, when this ministry was begun under the direction of Kim Matthews and Keith Jones, hundreds and hundreds of children have ridden one of the red and white buses to worship. We want to thank all the captains, drivers, secretaries, runners and teachers who give their love and compassion to bring souls under the sound of the Gospel. We have evangelized this community with the Bible school on wheels for over 30 years. Many doors have been knocked, many lessons have been taught and many souls have been brought under the powerful Word of God. The family has supported this outreach. The evangelism that has flowed through this county has planted the seed of God in hundreds. Ministries like this usually blow up then blow out but God has blessed us with a ministry that keeps on keeping on. The JOY bus Ministry will always provide God’s love to a lost world as long as God’s workers are filled with God’s love. It takes every church member to pray, give, and encourage one another in evangelistic soul-winning efforts. We thank you for letting God into your heart and we appreciate everything you do to keep the love of God heart, soul and mind. Today (04/06/14) is the first Sunday to run the new buses on their routes. It's been 35 years of bringing souls under the sound of the Gospel. The buses have air conditioning and teaching aids of DVD monitors. Thank you God for being so good to this family. Congratulations to Joy Bus #1 for winning Honor Bus and the Great Race for October 2014. Congratulations to the Blue Bus for winning Honor Bus and the Great Race for September 2014. Great job! Let's continue to be faithful to God and His teaching. Congratulations to the Green Bus Riders for winning the Great Race award and Honor Bus for the month of April 2014. Congratulations to the Green Bus for winning the Great Race & Honor Bus. "One expecting to go to Heaven should take time to learn the route."